Visions Vol. I No. 1, Fall 1976. Visions was published eight times yearly by Paranoid Publishing, Edmonton, Alberta. The publisher was Robert L. Thompson, editor David M. Vereschagin, and production was handled by Eugene W. Plawiuk. 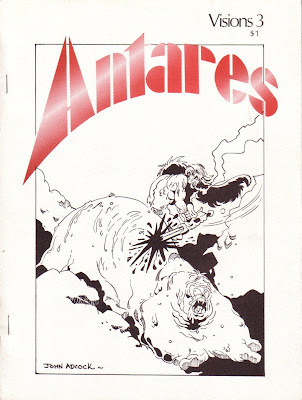 A serious fanzine devoted to science fiction which alternated with issues featuring comics. Artwork was contributed by John Byrne, David M. Vereschagin, Larry Hashman, and David R. Haugh. Articles and poetry were provided by David M. Vereschagin, Eugene W. Plawiuk, David Schamber, Dae Cronan, Debra F. Sanders, Mike Mitchell, Mike Davidson, and Bob Thompson. My own contribution was a cover and one interior illustration in Vol. I No. 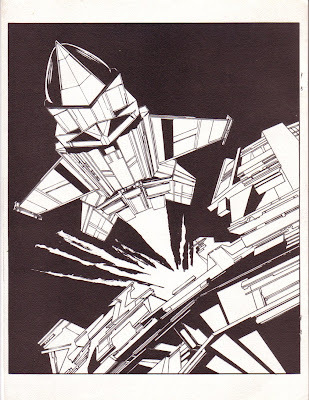 3, March/April 1977 along with illustrations by John Byrne (spaceship below), David M. Vereschagin, David R. Haugh, Randy Mohr, and Barry Kent MacKay. Writers were David M. Vereschagin, Eugene W. Plawiuk, Mike Mitchell, Rook Jones, H. A. Hargreaves, and Robert Anton Wilson. A letters column brought forth a comment from fanzine historian Harry Warner, Jr., of Hagerstown, Maryland, author of All Our Yesterdays (1969) and A Wealth of Fable (1976). Also heard from was Arthur C. Clarke. Wilson Tucker wrote in 1969 of Harry Warner, Jr. that he "is an indefatigable writer of letters of comment, and the young fan editor who publishes two or three issues without receiving such a letter is apt to fold up his presses and steal away in shame." Harry Warner, Jr., a newspaper man, printed and published the first issue of his own long-running fanzine, Horizons, on October 1939. David M. Vereschagin also published First Class no. 1 March 1977 in New Sarepta, Alberta. 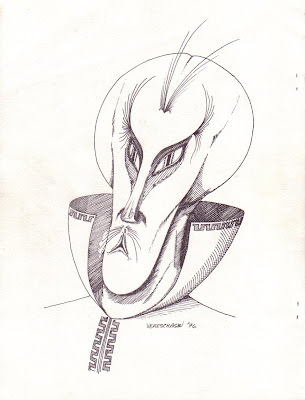 The Martian illustration immediately below appeared in one of the comic book issues of Visions. 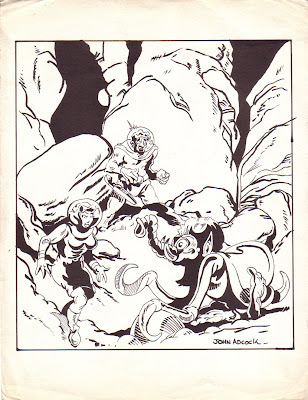 The first fanzine published in Canada was Supermundane Stories, for fans of fantasy and the supernatural, published in the late thirties by Nils Helmer Frome (pen name Herkanos) and featuring work from H. P. Lovecraft, Rider Haggard and Clark Ashton Smith. From the same time period came Croutch Magazine Market News, from Larry Croutch of Parry Sound, Ontario. Title changed to Croutch News, then Light, in 1941. William H. Gander of Transcona, Manitoba, inspired by American Ralph Cummings Dime Novel Round-Up, the 1925 British story paper fanzine Vanity Fair, and the Collector's Miscellany, long published in England by Joseph Parks, issued The Story Paper Collector Vol. I No. 1. For Jan/Mar, 1941 and it ran for 370 issues. Rocket (1941) was issued by Fred Hurter with help from Beak Taylor. 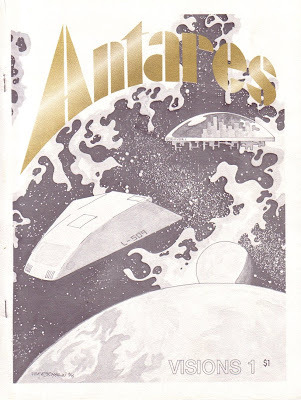 A fanzine had already appeared with that title and Rocket was changed to Censored. Mephisto, for weird fiction enthusiasts came out in fall of 1942 from Alan Child, and Eight Ball was printed up by Beak Taylor. By 1944 the only fanzine being published was Taylor’s Canadian Fandom published in Aurora, Ontario and survived until the late fifties under different editors. By the fifties Norman G. Browne was publishing Vanations in Vancouver, B.C. and Georgina Clarke was issuing various fanzines from Calgary, Alberta. Amor, Regina : Susan Glicksohn, 1973-1979. Editor: Susan Wood. Universe, Winnipeg : STYX, 1974-Editor: Joseph Krolik. Schmagg, Winnipeg : BeFlatte Publications, No. 1 1977. Editor: Michael S. Hall. Rothnium magazine, Owen Sound, Ont. : Cygolian Press, 1977 Editor: David Hull. The Monthly monthly (later Bimonthly monthly),Edmonton, Gang of Four, 1979-1980. Typo, 1978, Willowdale, Ontario, Editor: Taral Wayne. DNQ, Toronto 1978-1984. Editors: Victoria Vayne, Taral Wayne. Fewmets, Edmonton, 1980 Editors: Lorna Toolis, Marianne Nielsen. Maple Leaf Rag, Victoria, B.C. , Stop Press, No. 1 (Nov. 1983)-no. 30 (June 1987). *Please help yourself to the Comments section with any corrections or additions. The Canadian Fancyclopedia—the result of 15 years research by R. Graeme Cameron into the history of Canadian Science Fiction Fandom— details Canadian conventions, clubs, organizations, fanzines, prominent fanzine editors, APAzines, culture and traditions, as well as international fannish lore.